Made of 1200D waterproof ripstop poly outer shell with a breathable 210D poly lining and 250 grams of poly fill. Adjustable belly wrap for extra warmth. Adjustable neck for a custom and secure fit on any horse. Easy Adjust, double snap front closure with hook and loop for a more secure gapless closure. Shoulder gussets for better fit and better freedom of movement. Three dee rings to connect hoods or neck covers. 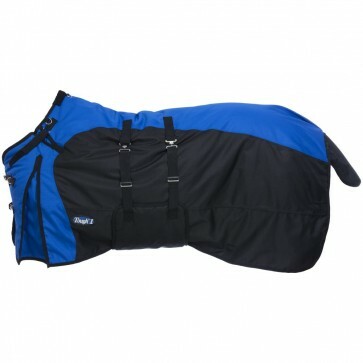 Fleece wither protection, removable leg straps and tail flap.